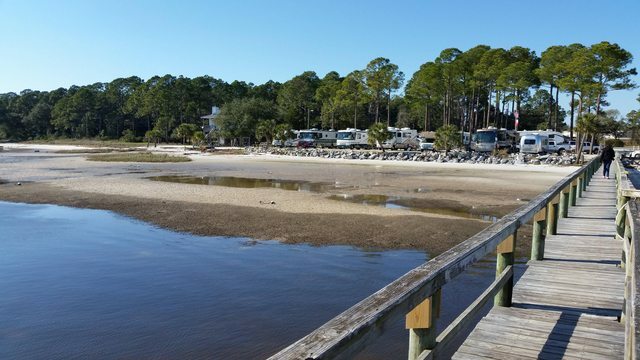 RV.Net Open Roads Forum: Destin full hookup and beach? > Destin full hookup and beach? Looking for good rv park in the Destin area. I would like to have a full hookup and easy beach access, hopefully a quick walk from the rv. Is there anything that fits the bill? Top sail is a nice park with FHU and large sites. You can take the tram to the beach bike or walk. I think Camp Gulf is the only one in the area that is directly on the beach. Expensive, but it has everything you're looking for. Camp Gulf is nice, but a little cozy. I found that most Florida beach front "resorts" are tight. In the beach front sites here you can't even open your awning. Agreed. Camp Gulf's beach front spots were the same (the rest of the park isn't this tight). But, the beach front spots are also not full hookups and they don't allow pets. Neither were an issue for me, but the OP did mention wanting full hookups. We could only open awnings because we lucked into having a motorhome on our front who pulled in. It meant we both pushed to the far outside of our spots and it gave us a bigger shared space. Otherwise, the site wan't much wider than my dual opposing slides of our bunkhouse. Holy Sardines in mustard sauce Batman. More power to you for being able to deal with that. It would have been too tempting to set a programmable remote to the guy in the class A' TV and switch his channels while he was watching it. The day I have to do that is the day I stay home, or stay at a beachfront hotel. Beach front sites at HoHum, east on the panhandle in Carabelle. We've stayed at HoHum and it didn't feel as crowded as that pic makes it look. But then again, we don't go to a place at the height of tourist season.